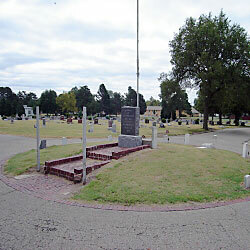 Description: A granite monument is emplaced in the center of a circle of Civil War Veterans headstones. 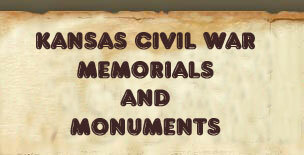 The monument is inscribed: "In Memory ~ Of ~ Veterans Of War ~ 1861-1865 ~ Erected By ~ Department Pap Thomas Post ~ No. 52 ~ G.A.R. ~ 1923". A headstone marked "Unknown" is placed next to the monument. 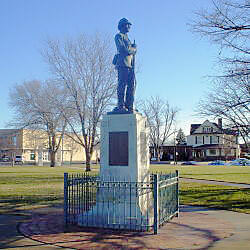 Description: A bronze soldier, at arms rest, is mounted on a granite base. Inscriptions on bronze tablets read: "Erected and Dedicated By Ira D. Brougher ~ Department Commander To Pap Thomas Post No. 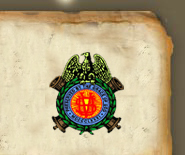 52 ~ Grand Army Of The Republic ~ Department Of Kansas ~ Veterans Of The War Of 1861 - 1865 ~ A.D. 1915 ~ Lest We Forget"
"Roster Pap Thomas Post No. 52 G.A.R. 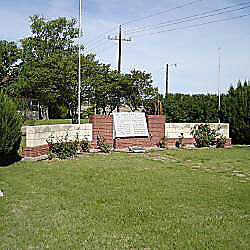 ~ 1915 ~ (names of all members) "
"Department Officers (names)~ Post Commanders (names)"
Description: A Veterans' monument is dedicated with a plaque reading: "Veterans Memorial ~ 1961 ~ This Flag Flies In Memory Of Those ~ From The Hoisington Community ~ Who Have Served Their Country ~ Erected By ~ American Legion Post 236 V.F.W. Post 7423". 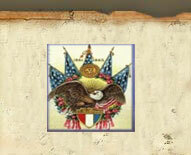 Description: Grave site for Nehemiah Carson, Pvt, Co G 1 Regt, MO Mtd Inf, Mexican War~ 1826-1846. This site is on the slopes of Pawnee Rock. 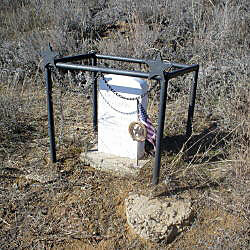 It is marked with an iron railing and tablets which are inscribed: "B.F. Larned Post 8 ~ G.A.R. Kans".